A very interesting match-up was made by Strikeforce, as Shinya Aoki faces Lyle Beerbohm at the promotion's April 9 card. 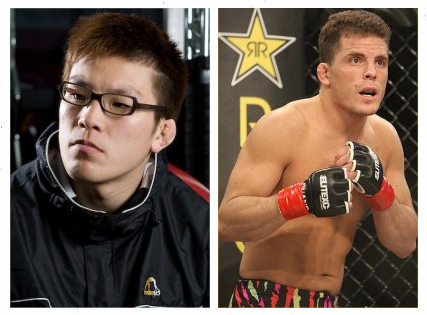 Rumors on who will face Shinya Aoki at Strikeforce’s April 9 card has been rampant for weeks now. Names like Hiroyuki Takaya and Gesias Calvancante emerged, but it seems that Lyle Beerbohm will be the one to challenge the Japanese grappler. If not bizarre, the Shinya Aoki vs Lyle Beerbohm fight is an interesting match-up for Strikeforce to make. Lyle Beerbohm was on a 15-fight winning streak, after suffering his first loss to Pat Healy last February. Shinya Aoki, on the other hand, carries a three-fight victory sweep before acquiring a knockout loss from Yuichiro Nagashima at Dynamite! 2010.
Who do you think will win between Shinya Aoki and Lyle Beerbohm? Let everyone know by leaving a comment.